redspokes is a terrific tour company. Our trip through Laos and Vietnam was inspired. A trip leader has to make dozens of decisions every day to accommodate his clients. In the course of our 21-day trip, our redspokes guide, David Walker, never made a bad one. He was unfailingly well-informed, resourceful and fun to hang out with. 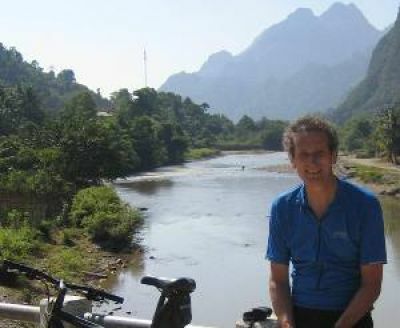 In addition, the itinerary redspokes chose was spot on, taking us through gorgeous and bike-friendly corners of Vietnam and Laos. I don't regret a single kilometer. Plus, every meal we shared was delicious... and, for the record, there is no post-ride recovery drink like a Beerlao. As ever it was a hugely enjoyable experience. Our tour leader was outstanding in every respect. Open, friendly and professional. He dealt with everybody's issues no matter how trivial. Life changing trip! Great to meet these wonderful people showing us their fascinating countries, and with warmth, humor, and passion. Biking is the only way to see it, and I'd do it again in a heartbeat. It was as good as it gets! my thanks to all that guided us through this adventure.